Streets aren't just for driving, and cities are starting to realize it. Amber Hawkes and Georgia Sheridan explain why street design matters and where we are today in terms of designing the "street space." "uninspiring, careworn, often over regimented streets that at best could often be described as ordinary . . .There is a lot of work to do just to catch up with standards set by neighbouring authorities and nationally comparable destinations, let alone begin to make our own mark." "The streets of New York are often seen as permanent fixtures of city life, and in some ways, they are. But our streets are also dynamic, and their character and uses can change as the city continually evolves and reinvents itself." 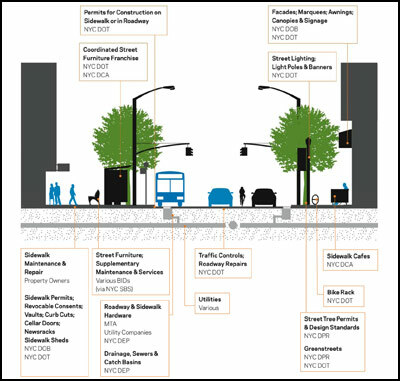 A page from the City of New York's Street Design Manual, released this May, outlining the many departments and agencies involved in designing, constructing and maintaining the City's streets. From the UK to New York, New Zealand to Abu Dhabi, Bogota to Brighton, cities across the world are looking to makeover their public streets with progressive design manuals and toolkits that address "Livability." For the past century, street design has been geared towards the automobile. Design regulations have prioritized uniformity and speed over character and livability, leaving pedestrians, bicyclists, and transit users competing for the residual space. The effects of this type of design are everywhere – streets with no sidewalks, sidewalks with no shade, pathways cluttered with telephone poles, utility boxes, and criss-crossed with access roads and garage driveways. Dozens of cities (including New York, Chicago, San Francisco, Seattle, Los Angeles, Washington, D.C.) have decided to put the "public" back in "the public right of way", reclaiming and redesigning this urban land to satisfy a greater number and type of uses. Through design toolkits and manuals, cities are regulating the street space to improve our economies, our mental well-being, our environment, and our physical health. On average, streets, sidewalks, and alleys occupy between 25-30% of our urban land. As the largest chunk of undeveloped space in cities, streets present an incredible opportunity to address a wide range of urban problems. And since they are publicly-owned, cities do not need to negotiate ownership, maintenance, and regulatory control. Our street spaces are the ultimate untapped urban resource, a public land bank that is waiting to be cashed in. Why is Good Street Design So Hard to Come By? There are several reasons why good street design is difficult to achieve. First, streets must fulfill a wide variety of functions for diverse groups at different times. Designing streets to satisfy all users is tough. Second, historically street design has been the role of the traffic engineer whose goal it was to move traffic through streets, rather than to attract people to lingerin shared public space. Third, as cities look for new street design methods, a wide variety of engaged parties are eager to have a seat at the negotiation table, including bicycle coalitions, stormwater experts, bus rapid transit advocates, business improvement districts, community gardeners, school districts, utility companies, etc. While participation of these groups allows for more holistic design, achieving consensus among disparate parties is challenging. Fourth, the power to regulate the street space is dispersed in ways that makes communication and collaboration difficult to achieve. In most cities, the Department of Transportation regulates the street space, while other agencies and departments such as Planning, Parking, Public Works, Economic Development, Fire and Public Safety, and Historic Preservation also have a stake in street design. Fifth, timing and money are always a challenge. The transformation of city streets requires vision and courage, but also patience and consistency for long-term change. Elected officials may tend to stray from projects that require immediate investment and provide small, incremental changes. 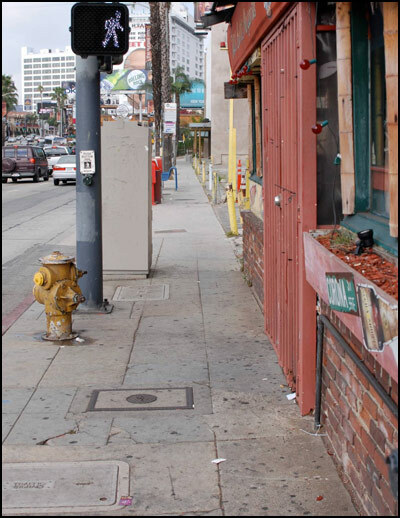 Cluttered with utilities boxes, telephone poles, and fire safety equipment, this narrow, shadeless sidewalk in Los Angeles provides little place to move and no place to linger. Despite this unpleasant, unattractive environment, gum stains show that public space is highly trafficked by pedestrians sandwiched between cars, bars, and parking lots. Photo by Georgia Sheridan. For many communities, street beautification has been viewed as an unnecessary expense. But as cities compete for investment, new residents, and tourists, there can be a substantial return on design dollars. The Value of Urban Design, produced by the Commission for Architecture and the Built Environment (CABE) in the UK, quantifies and defines the monetary benefits of thoughtfully-designed urban spaces. CABE argues that good urban design adds value by: producing higher returns on investment; producing local competitive advantages; raising prestige; responding to demand of local businesses; providing benefits to local workers (through productivity gains and the like); and reducing management, maintenance, energy, and security costs. And indeed, cities that have invested in their public realm are seeing improved property values and increased retail sales. Appropriately-placed pedestrian zones in city centers boosted foot traffic by 20-40% and retail sales by 10-25% in the UK. A nationwide study in the US reported a property value increase of 30% after new traffic calming measures were installed. In New York, apartment prices near community gardens are 7% higher than comparable apartments in the same neighborhood. Since the City of Mountain View, California widened and enhanced its main downtown street by improving sidewalks, removing parking spaces, and planting trees, the street has drawn $150 million in private investment in residential and office units and has become a regional attraction. Understanding that it takes money to make money, cities are investing in street beautification projects. Undoubtedly, street design has profound effects on the quality of our urban environment. Environmental problems have reached a tipping point in which the cost of consumption is outpacing the cost of conservation and mitigation. As cities look for ways to reduce their million dollar clean-up tabs for air and water pollution, bulbouts, bioswales, and bike lanes are becoming standard design elements in the latest wave of street design manuals. Smart street design can reduce area temperatures, absorb storm water, combat air pollution, and save cities money. Portland's Green Streets Program, Chicago's Green Alley Handbook, and New York City's High Performance Infrastructure Guidelines all look to streets as an area to improve environmental quality through good design. A recent study predicted that by increasing the reflectivity of pavement through the use of albedo content, Los Angeles could save $15 million a year in energy savings and $76 million a year in medical expenses related to smog. Seattle's Street Edge Alternatives Program, which addresses urban runoff, found that 95% of stormwater could be treated by green streets that cost 20% less to build than conventional ones. A study of the Washington, D.C. Metro region found that trees reduce the need for stormwater retention structures by 949 million cubic feet, an estimated value of $4.7 billion to the City over a 20-year cycle. In Atlanta, Georgia, it is estimated that 19 million pounds of pollutants are removed annually by trees, a $47 million savings. Streets, like all of the spaces in which we function, affect our mental well being. CABE reported that 80% of people they polled say they are interested in how the built environment feels and 85% say that the quality of the built environment makes a difference to the way that they feel. Many studies show that people choose to sit on public benches in centrally located places rather than removed ones. Children prefer to play on streets, in parking areas, and in front of building entrances instead of designated play areas in their own backyards. The street, as an extension of the built environment, has an emotional value that should not be overlooked. As such, the psychology of space is making its way into progressive street design manuals. The Florida Pedestrian Planning Handbook (PDF) for the Department of Transportation and the City of Chicago's Streetscape Guidelinesfor the Department of Transportation include sections that emphasize how street design affects people's mental health. 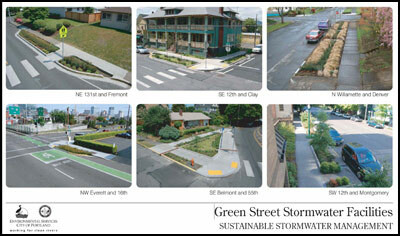 A green streets poster produced by the City of Portland as part of the Environmental Services Green Streets Initiative. Street design also affects our physical health. Attractive and accessible public spaces are inviting to people for passive exercise (e.g. a casual window-shopping stroll) and active exercise (bike-commuting to work). A new study by San Diego State University published in a recent issue of the American Journal of Preventative Medicine, shows that the presence of sidewalks can influence our health by encouraging people to exercise. The study reports that cross-culturally, people who live in a city neighborhood are twice as likely to be physically active than those living in the suburbs. In fact, in looking at data from over 11,000 surveys in 11 countries, the main factor influencing physical activity is accessibility to sidewalks. The speed of traffic along streets, something that new street design policies are trying to address, also greatly affects our health and safety. A pedestrian hit by a vehicle traveling at twenty miles per hour (20 mph) has a 15% chance of death compared to a 45% chance of death at 35 mph. When hit by a vehicle traveling at just 40 mph, a pedestrian has an 85% chance of dying. Designing streets as safe, attractive, shared spaces for vehicles and people is essential to reducing pedestrian fatalities, as well as encouraging physical activity for a healthy population. "Forward-looking cities shouldn't be succeeding despite Washington; they should be succeeding with a hand from Washington. We want to hear directly from them, and we want to hear directly from all of you, on fresh ideas and successful solutions that you've devised, and then figure out what the federal government should do or shouldn't do to help reinvent cities and metropolitan areas for the 21st century." As the Obama Administration looks to transform hope into action, now is the time for cities to speak up and let their successes and failures be heard. Lessons learned on livable streets might be the best place to start. The next article in the series on Rethinking the Street Space looks at the evolution of street design and regulation over the last two centuries. The article sheds light on where we are headed and how to best approach the design of our street spaces. Amber Hawkes and Georgia Sheridan are Urban Planners and Designers working in Downtown Los Angeles at Torti Gallas and Partners. They have lectured at conferences and universities and have worked in a variety of capacities that inform their planning and design work, from behavioral art therapy, social work, and historic preservation, to health law policy, green building policy, and journalism.